Well, I don't honestly know what more I can say about Farenheit 451 that hasn't already been said before. I recently read the book for the first time in quite awhile as I'm entering the contest Simon and Schuster has opened to design the cover for the 60th Anniversary Edition, and I wanted it fresh in my head while I was designing. 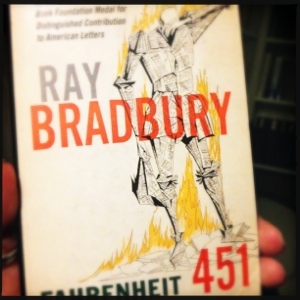 That said, it has probably been since high school since I read the book last, so I don't think I truly understood the implications of the book, and how relevant so much in the book is, even today, 60 years after Bradbury wrote it. The story follows the journey of Montag, a fireman, as he begins to grow a realization that perhaps his life's work may be wrong. As a fireman, Montag's job isn't to prevent fires, but cause them. The firemen in this dystopian world burn books, as they have been outlawed, and when we meet Montag, it seems he may already be questioning this practice. He may or may not already be seeing the importance of books in society, and what follows is his own discovery of what books mean to him. It's a fascinating story, and if you haven't ready it yet, I highly recommend it. What also surprises me now, and as something that may have seemed more like science fiction than not even when I was in high school, is how accurate Bradbury was in predicting certain technological advances that we now almost take for granted. The earbuds (or seashells) that many of the people use in his book are very similar to current bluetooth devices and earbuds for our smart phones, as well as the wall-sized television screens. While we don't have television screens the full size of our walls, nor do they surround us on all four sides of the room, our current flat screen televisions are getting bigger and bigger, and how long until it takes up the space of an entire wall? Bradbury's prescient descriptions of so many things we take for granted now seems almost eery to me. Needless to say, I find that Fahrenheit 451 is just as relevant now as it probably was 60 years ago, and if you haven't read it yet, you should. I think this is one of those books that everyone should read at least once in their lives. Once Upon a Time Machine is a collection of fairy tales that we're all familiar with, set in time periods that are unfamiliar to these stories. Each of the fairy tales holds true to its origins, but they are retold in a a whole new fashion, with each of the tales taking on a science fiction flare. 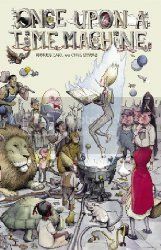 Told by some of the new, up and coming writers and illustrators in the comics business, these fairy tales are both familiar and fresh at the same time. I wouldn't recommend reading them all at once. Take your time reading the tales, as rushing through them (like I did, unfortunately, for the first half of the book) seems to take something away from the. It's when I would read one or two and set the book down that I was able to really appreciate the storytelling that went into the retelling of the fairy tales. I'd have to say my favorite of the tales is actually the first story in the collection, Pinocchio. It really keeps the innocence of Pinocchio intact while transporting him to an entirely new time. Recommended for fans of fairy tale re-imaginings. 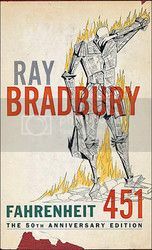 I've entered a contest hosted by Simon and Schuster to design the cover for the 60th Anniversary Edition of Ray Bradbury's Fahrenheit 451. Wish me luck! OK, so I may not have gotten around to reviewing A Discovery of Witches yet, but I really do love that book. I love the pacing, the characters, the world building, everything about the book. I had taken quite a while to get around to reading it, despite the pressure from some friends to get to it sooner than later. I decided the best way to do this was to get the audiobook, and I'm so glad that I did. Jennifer Ikeda does a fantastic job on the audio; as far as I'm concerned, hers is Diana's voice. When Shadow became available at my library, I jumped at the chance to check it out. Harkness doesn't waste any time throwing us into the story, with this book picking up directly where Discovery leaves off. It opens with Diana and Matthew arriving in 1590s England, and a good portion of the beginning of the book deals with Diana adjusting to her new situation. Eventually, she adjusts to the time period, being able to somewhat pass herself off as a lady if the time. During this period, however, one of my main complaints in the story begins to build, and that is just how well connected Matthew is in this time. He seems to know everybody, from Shakespeare to the Queen, and everybody in between. He seems to be involved in every secret society, attached to several government bodies in some sort of secret capacity, and Harkness doesn't mind reminding the reader of these facts at every turn. After awhile, I just wanted to yell at the book, "I get it. He's important. Move the story along." It just seemed like a bunch of name dropping to me after awhile. Eventually, we get past all the connecting and name dropping and adjusting to life in the 1590s and the story is able to move along. I liked how Harkness handled their time traveling, with the choices Diana and Matthew make affecting how the future changes in small, seemly insignificant ways, unless those in the present know what is happening and know what to look for. I thought this was a clever way of handling their traveling back to the past. Diana learns about herself as a witch and what exactly her powers may be, and how to control those powers. This, in my opinion, was the best bit of the book. The character of Goody Alsop is also my favorite new character in this book, and if really like to see a book all her own someday. I think her story deserves telling. I don't want to give too much more away, as it's too easy to get too spoilery with the story, but eventually Diana and Matthew do make it back to present day after a few more (some surprising!) adventures in 1590s Europe. However, there was something about the end of the book that just didn't sit well with me, and I haven't been able to put my finger on it. I thought it had to do with Diana and her reaction to leaving London after having only been there less than a year, and how hard it was to say goodbye to the people she met there. I thought maybe she became a little too attached to the era too quickly, but I'm not sure that's what it is. Don't get me wrong, the book is still fantastic, but it left me wanting just a little more than Discovery did. Of course, I'll be picking up the final book in the series, and will probably be looking out for anything else Harkness writes in the future. 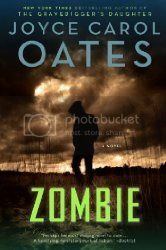 WWW Wednesdays 11-14-12 - What am I reading this week? And.... I'm still working on Titus Groan by Mervyn Peake. This is a very slow going book. I'm enjoying it, but can only read chunks at a time, as it's a very densely written book. I'm hoping that I can just hunker down this weekend and finish it up. I've got other books calling my name! I started listening to Anne Rice's Angel Time, and seriously, I don't even know if I'm going to be able to finish it. I'm about halfway through the book, and nothing has happened yet. Nothing. The audiobook only takes up 7 CDs and I'm just finishing up CD 3, and I don't feel like I'm any more vested in the story than I was just looking at the CD cover at the library. I don't know. It's so short, I'll probably stick with it, but I'm not impressed. The book is about a serial killer, Lucky the Fox, who I'm assuming is unknowingly working for the devil, and a seraph has come to him to try to lead him away from the life he's currently living. That's basically all I've gotten out of the book so far. I picked up Philip Pullman's Fairy Tales from the Brothers Grimm: A New English Version yesterday, and I think I'm going to work on one fairy tale at a time in this one. They are fairly short, so this won't be a problem. What I especially love about this book is after each fairy tale, Pullman also gives a short history of how the Brothers Grimm discovered the tale, and also how similar tales turn up in other cultures. For fans of fairy tales, I'd highly recommend this book! I read the collected edition of the Avengers vs. X-Men storyline from Marvel comics. Some of their stories have been a little scattered lately, but I really think Marvel got this one right. Naturally, there was some points to the story that I felt jumped around too much (I actually think this story would have benefited from a couple more issues), but overall I really enjoyed this story. It brought back one of my favorite aspects of the Marvel universe, the Phoenix force, so that was a definite plus for me. I'll be interested to see where the events of this story take the rest of the characters in the future. My local Indie Schuler Books is hosting Cherie Priest as part of her tour to promote The Inexplicables, and I know I said last week that I was going to get around to reading this, but I've been busy with life, so I'm putting it off until this weekend. Well, that's it for this week. Thanks for stopping by and happy reading! 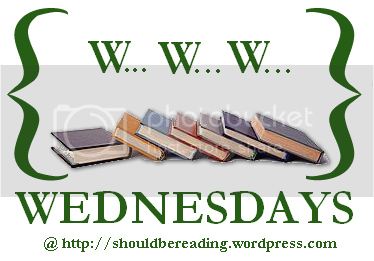 WWW Wednesdays 11-7-12 - What am I reading this week? First off, what happened to the last week? I've barely read anything. What did I do the last week, you ask? Good question! The week apaprently just got away from my. I'm still working on Titus Groan by Mervyn Peake, the first book in The Gormenghast Trilogy. For those that asked last week, even though the majority of the beginning of the book is one big character introduction/study, I am enjoying it. It's very wordy, so it's not necessarily a breeze to read through, but I'm determined to stick with it and finish it! My next audiobook selection is going to be Anne Rice's Angel Time. This is a fairly short book, which equals a fairly short audiobook, so I think I should be able to zip through this one fairly quickly. I won't be starting this one until tomorrow, so I don't really have anything to say about the story yet, but I'll hopefully be able to get it finished and reviewed by next week. I finished Deborah Harkness' Shadow of Night on audiobook. 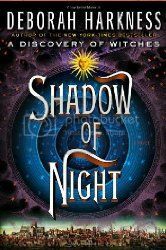 I ended up enjoying this one as much as A Discovery of Witches, but at some point along in the book, I was beginning to wish that the story was moving along just a little bit faster, and there were a few things that I didn't think held together all that well. For instance, at some point at the beginning of the book, it comes to light that Matthew is a member (and usually a high ranking member) of just about every secret society that you could find in 1590s London. At some point, even with a pretty heft suspension of disbelief, this began to feel a little forced. At some point, I just wanted to scream at the book, "I get it! He's important! He's got even more secrets than I knew about in the first book! Let's move along now!" Other than a few instances such as that, I thoroughly enjoyed the book. I love her character development (I particularly liked Goody Alsop. I'd like to see a book all about her! ), and am looking forward to see how she's going to tie up all the plot threads she has going in the final book. My local Indie Schuler Books is hosting Cherie Priest as part of her tour to promote The Inexplicables, and I am thrilled to finally be able to meet her. (I'll have met both of my two favorite Steampunk authors now this year, having met Gail Carriger earlier in the year.) I have all of her books, so am looking forward to getting everything signed! So, in anticipation of the event, I'm going to be working my way through her books that I haven't read yet, and up first is her Southern Gothic ghost story, the Eden Moore trilogy, the first book of which is Four and Twenty Blackbirds. I've read this one before, but it's been quite some time, so I'm going to start at the beginning to make sure I remember everything that happened. If I remember correctly, this was a fairly quick read, so I don't think I'll have any trouble getting through at least this series before her signing.